Tomoe Gozen is a famous female warrior in Japan who highlights the reality that women played various roles in Japanese society, outside the subservient model often portrayed. Indeed, even before the emergence of the samurai, females had learned to use military weapons and techniques in order to protect communities. Therefore, Tomoe Gozen is one of the most famous female warriors to emerge long before the Edo period began. Japanese females were taught with specific weapons that were deemed suitable for body weight, height structure, and speed. These weapons notably apply to naginata and kaiken (dual purpose) along with the fighting art of tantojutsu based on varied systems of knife fighting. 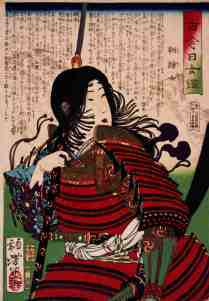 In the world of Japanese woodblock prints, the images of Tomoe Gozen and other female warriors became potent. This equally applies to historical realities, even if some stories are fused inside Japanese folklore – and based on the attractiveness of the subject material. Tomoe Gozen was deeply loyal to Minamoto no Yoshinaka. Therefore, she helped this famous warrior in the twelfth century. War in this period was often a culmination of conflicts between the Minamoto and Taira. This was based on both rival dynasties desiring to control the main centers of power in feudal Japan. However, true to history, internal intrigues within the Minamoto meant that Yoritomo believed that Yoshinaka was dangerous based on his alleged power grab. In 1184 the battle of Awazu led to the demise of Yoshinaka based on intrigues related to power concentration. 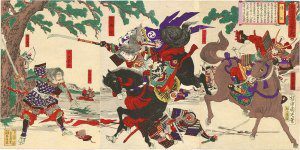 It is known that Tomoe Gozen killed at least one combative by taking his head in this battle. However, once Yoshinaka understood the fate that awaited him, he told Tomoe Gozen to flee at once. 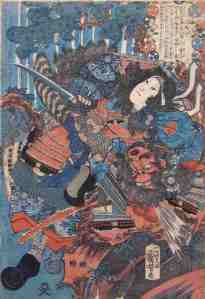 Tomoe Gozen remains famous in contemporary Japan based on the fascinating nature of her life.